Which Skifield is right for you: Cardrona or Treble Cone? 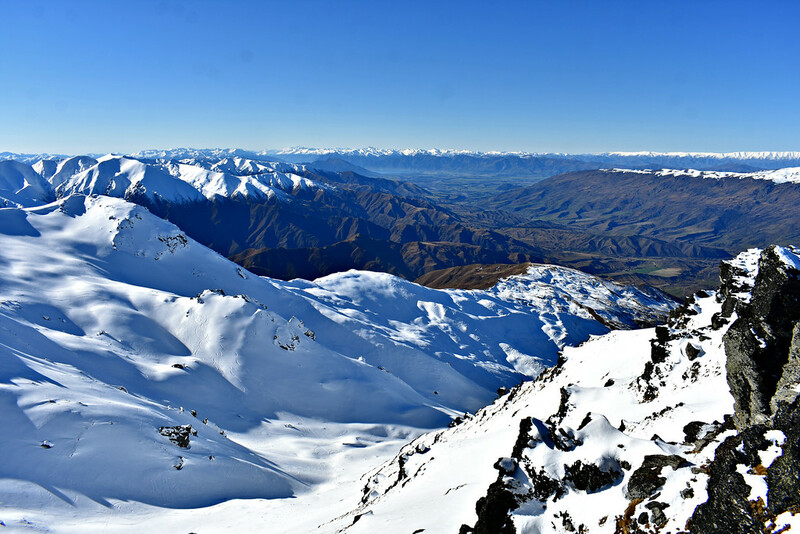 Being based in Wanaka, New Zealand we are conveniently located between the two skifields, Cardrona, also known as Cardies, and Treble Cone or TC. While planning for our working holiday to New Zealand, we scooped up earlybird, saver passes to Cardrona. Among our fellow expats however, there seems to be a split between those with passes to Cardrona and those with passes to treble cone. So what are the differences between the two ski fields you may ask and more importantly which one is right for you? Cardrona offers lift passes for 99 NZD in June and October and 115 NZD from July through September. Treble Cone offers an adult day pass for 135 NZD, an afternoon pass for $95 NZD between 12:30pm to 4pm, and after 2:30pm for 50 NZD for the entire season. Cardrona also offers an ADULT SAVER pass for a reduced price with a blackout period during the school holidays during the first three weeks of June when the New Zealand and Australian school holidays overlap. ProTip: If you buy an early bird saver pass like we did, you can save up to 50% of the full adult unlimited price. Consider that the school holidays are a very busy time with lift wait times up to half an hour. Summary: Cardrona is less expensive than Treble Cone and has a longer season. In terms of cost and value in terms of more ski days available, Cardrona comes out on top. Cardrona Skifeld currently has 345 hectares of skiiable terrain and offers 25% Beginner, 25% Intermediate, 30% Advanced, and 20% expert terrain. The terrain at Cardrona Skifield is fairly evenly balanced between the various levels of terrain. Runs are generously wide. However, in July 2018, Cardrona announced their expansion through a partnership with Soho Basin, which would add an additional 500 hectares to the Cardrona skifield, making it the largest in New Zealand in a few years time. Cardrona also features an extensive terrain park and pipes for freestylers. Cardrona has four chairlifts, one platter for the park and three conveyor belts in the beginner’s area (or as we would call it – the bunny hill). In 2017 they opened a combined chair and gondola lift, the McDougall Chondola. Cardrona was the first skifield to implement gondola cabins in New Zealand. 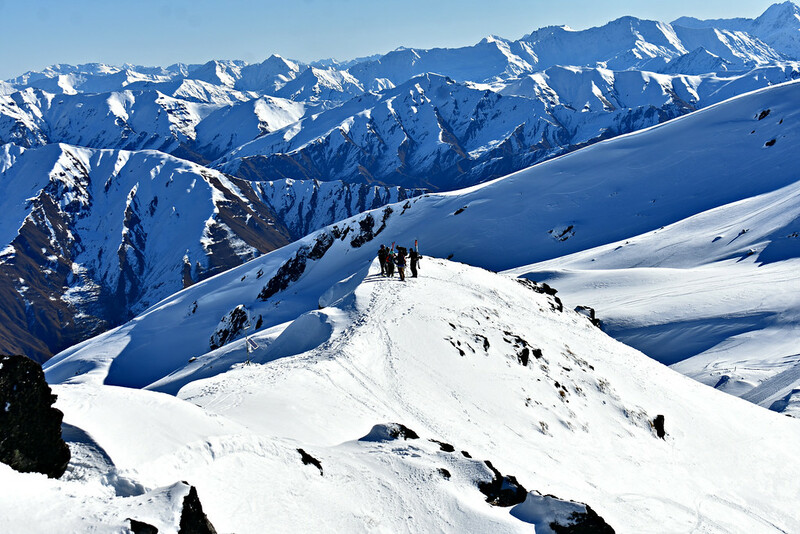 Treble cone is South Island’s largest ski area for now, at 550 hectares of skiable terrain. The The beginners’ terrain only makes up 10% of the area. The bulk of the terrain is split between intermediate (45%) and advanced terrain (45%). TC is better suited for advanced skiiers and riders or keen, fearless beginners. Expect more narrow and steeper runs compared to Cardrona. TC has two main chairlifts that service the majority of its visitors. In the beginners’ area there is a service platter and short conveyor belt. Summary: Cardrona attracts skiers and riders with their family friendly advertising and terrain park. It is a well rounded mountain with terrain for all levels, particularly beginners. Treble Cone has more challenging runs and is suited better for those who want to keep things interesting. Cardrona has eight cafe and restaurant options on the hill. Grab cafeteria style food in the Base and Captains, warm your bellies at the Noodle Bar, or unwind with table service at the Mezz. Treble Cone has six cafe and dining options on the hill, serving coffee and snacks, breakfast, barbeque meats, and noodles as well. Summary: Cardrona has a wider variety of food and drink than Treble Cone. TC offers a free shuttle service from Wanaka to TC. There are two departures in the morning leaving Wanaka and two departures in the afternoon to return to town. Check the times here. Additionally you can drive to the base of TC and take a free shuttle up the switchbacks to reach TC. The shuttle runs more frequently-about every half hour or so- and is a great option for those that are unsure whether their vehicle can make the journey up or don’t want to be dependent on the shuttle’s fixed departure and return times to and from Wanaka. If you’ve missed the bus you can try hitchhiking to TC instead. Try standing by the Wanaka Lake parking lot exits along Wanaka Mount Aspiring Road. Cardies offers a mountain transport shuttle service for 35 NZD roundtrip once a day in the morning from town. Alternatively, similar to TC, there is a shuttle bus that runs every half hour from the Pine Trees parking lot, 1km along the access road after turning off Cardrona Valley road. The shuttle operates only in July and August and costs 15 NZD per adult. Hitchhiking to Cardrona is easy. Most hitchers stand along McDougall Street, near the St Columba’s Anglican Church. The earlier you go, the easier it is to be picked up. By 11am, you may find it difficult to find a ride up. Parking is available just after you pull off Cardrona Valley Rd and before you enter the access road that brings you to Cardrona, at Pine Trees where the shuttle picks passengers up, and at 6 other parking lots by the time you reach the top. Protip: If you have a season pass or have bought a lift pass in advance park at Little Meg’s and avoid the last few kilometers of switchbacks winding up to the top. The Valley View Quad starts from Little Meg’s so you can almost ski or ride to your car. Join the Facebook group Cardrona and Treble Cone $5 Carpool and look for rideshare offers or post a request for one. The facebook group Wanaka Carpool is mainly between Wanaka and Queenstown or other South Island towns but you could always get a ride part of the way to Cardrona and hitch up the rest of the way. Female skiiers/riders can join the Fanny Pack Wanaka group on Facebook. Summary: Treble Cone takes the cake with it’s free shuttle service from town and from the bottom parking lot at TC. Those heading to Cardrona will have to either rent or own a car, rideshare, or hitch up, or otherwise pay for a 35 NZD shuttle bus from town or 15 NZD shuttle from the bottom parking lot. Cardrona is a busy skifield and popular with tourists, locals, families and professional skiiers and riders chasing winter. If you ask locals why they go to Cardies, they will tell you it is a fun resort to be at and a great place to ride with your mates. However, you can expect Cardrona to have queues up to 20 minutes during the season or 30 minutes during the school holidays in July. To the East you have Cardrona Valley and Lake Wanaka in the distance and on the West facing side you can see all the way to Queenstown. Treble Cone caters more to the more advanced skiers and riders and those seeking steeper, more challenging terrain and powder. It is a quieter resort with plenty of space to explore. TC sees less crowds and shorter queues than at Cardies. TC has views of Lake Wanaka and Mount Aspiring. Summary: Cardrona has a more jovial, fun vibe while Treble Cone is more relaxed and low key. TC has arguably better views than Cardrona. Stay in Wanaka, whether it is for a few days, a season, or longer. If you are keen to get to know the ins and outs of the town, check our Guide to Moving to Wanaka. The best hostel to stay in is the YHA Wanaka, they have hands down, the most fabulous views of the lake of any of the hostels. They have both dorm rooms and private rooms. Just walk out the front door and be at the beach in 2 minutes. Cardrona offers rentals both in town and on the mountain. If you are skiing for multiple days you can simply leave your rental skis or board in the rental storage room so that you can pick them up the following day. This way you don’t have to take them down or go to the rental shop to be fitted every day. Treble Cone offers rentals on the hill but not in their office in town. If you want to save some money it would be cheaper (up to 50% less) to rent your ski or snowboarding package in town from Outdoor Sports or Greentoad. We would strongly suggest Cardrona if you are either a beginner or intermediate skier or rider looking to improve their skills, or practice on the park and pipe terrain. Expect longer queues tempered by a fun atmosphere. More experienced riders and skiers should head to Treble Cone for its steep chutes, powder, and tremendous views. TC is a more low key environment which comes with shorter queues and more time on the hill.